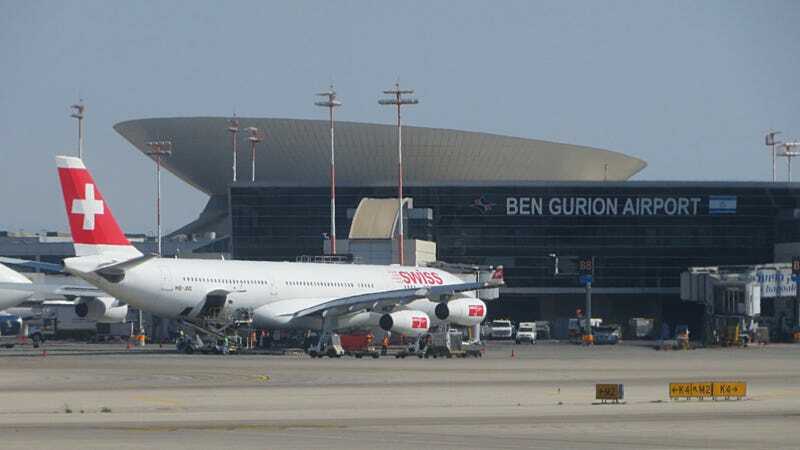 Following the deaths of his wife and child in an Israeli airstrike, Hamas leader Mohammed Deif has announced plans to attack Ben Gurion Airport in Tel Aviv, beginning on Thursday at 6:00AM local time (11:00PM EDT tonight). Reports across the web are saying rockets have already been fired at the airport, but are not confirmed. Ben Gurion Airport is the home base for El Al — widely regarded as one of the safest airlines in the world, in terms of security. El Al was victim to several incidents of terror in the late 1960s, forcing then to implement one of the world's strictest security regimens. In July, 1968, three members of the Popular Front for the Liberation of Palestine (PFLP) hijacked El Al flight 426, a Boeing 707 traveling from London to Tel Aviv. A hijacker opened the cockpit door, which was not locked, pistol-whipped the copilot, and demanded to be flown to Algiers. Two other hijackers kept passengers at bay with pistols and grenades, ready to be thrown. Once they landed in Algiers, all non-Israeli citizens were released the next day, and flown to France. A few days later, women and children were released. After five weeks in captivity, the remaining hostages were freed after Israel negotiated their release in exchange for the mutual release of sixteen Arab terrorists. In December 1968, El Al flight 253, another Boeing 707, was attacked by PFLP members during a stopover in Athens, Greece. A gunman fired at the plane for over a minute with a submachine gun, while another attacker threw two grenades. One passenger was killed by a bullet which had penetrated the aircraft. In 1969, PFLP militants attacked El Al flight 432 that was preparing to depart Zurich, Switzerland. One flight crew member died as a result of his injuries. An undercover Israeli security agent, who was stationed on the plane, fired at the four attackers and killed the group's leader. The other four were arrested, tried by Swiss authorities and imprisoned. Arrive at the airport three hours before departure. Prior to TSA screening, you're asked a series of questions by one of El Al's own staff. These questions are related to everything from what's in your luggage, and who packed it, to where you work and why you're flying to Israel. Racial profiling. They single out young Arab men, based on terrorism history. El Al also uses double-reinforced cockpit doors, and a missile-defense system called Flight Guard. In July, the FAA told U.S. carriers to stop flying to Israel, due to threats of missile attacks. But El Al has continued service, due to this extra safety measure. Simply put, the system is housed in a pod that is attached to the bottom of the plane, deploying counter measure flares when it detects an inbound missile. In spite of being the safest airline in the world, timeliness is not a concern for El Al. They're noted to have a measly 65 percent on-time performance record, ranking them dead last in the world. But it's obviously better to arrive safely, than to not arrive at all. This story will be updated if or when additional news breaks.